Beautiful Venetian glass earrings in a great bicone shape with a clear Swarovski Crystal. Each bead is handmade over a torch and subject to slight variations. The earwires are .925 Sterling Silver. Lightweight and go anywhere, jeans, suit or evening wear. The bead is about 18mm across and 14mm thick. A little over 1 1/2 inch. 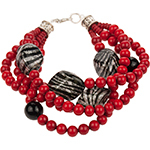 We handmake these here in our own studio with the authentic Murano Glass Beads.